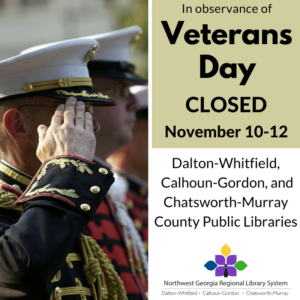 <!-- mp_trans_add -->We will be closed for Veterans' Day on November 10th-12th. We thank our veterans for their sacrifices on the behalf of their country. We hope that all members of our community can spend this time with loved ones and friends. No materials will be due while we are closed. Our drop boxes and downloadable items will still be available.